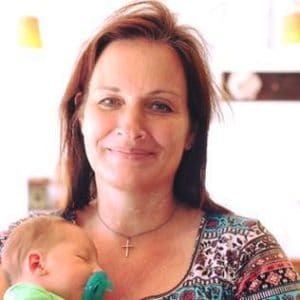 May 2, 2018 0 comments on "How to Care for Baby Ducks"
Baby ducks are so cute. I don’t know which are cuter, baby chicks or baby ducks. I think the ducks have a little bit of an edge, with their big beaks and webbed feet. They are so darn cute! We are new to raising ducks so we have had to start from the beginning to figure out how to take care of our new pets. 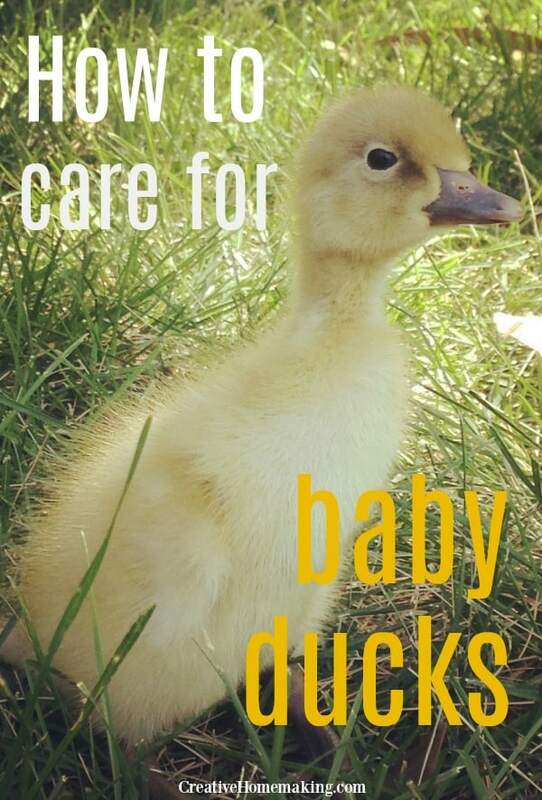 You will need a few things to get started with baby duck care. *We placed a small piece of chicken wire on top of the container to keep curious dogs and cats away from our ducklings. You can find everything you need at your local feed store. These are all the same supplies you need to raise baby chicks. 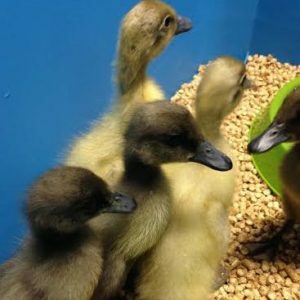 You can find baby ducks in most feed stores during the spring months. They will normally have them right along side the baby chicks. There are a number of types of ducks you can purchase. Ducks come in many shapes and sizes, and some are better egg layers than others. Our family loves Indian Runner Ducks. They are tall and elegant looking and are great egg layers. I love watching them follow each other around the yard. We also have several Rouen ducks, which are also great egg layers. What do baby ducks eat? You can feed baby ducks non-medicated chick starter feed that you would buy for chickens. 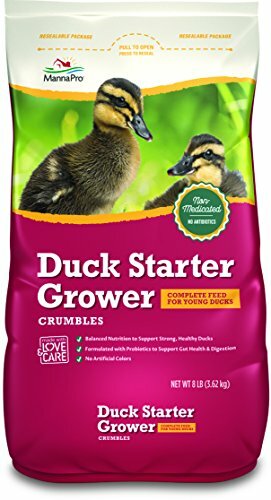 You normally would feed baby chicks medicated chick starter feed, but ducklings need the non-medicated kind. Amazon does have feed especially for baby ducks. It’s called duck starter crumble. Make sure not to feed your adult duck adult (medicated) chicken food. Medicated chicken feed contains ingredients that aren’t good for your ducks. Most adult chicken feeds, however, are non-medicated, and those feeds are fine for feeding your adult ducks. We feed our adult chickens and ducks the same food. You will need a large plastic storage container to keep your ducklings in. Place several inches of bedding in the bottom of the container. 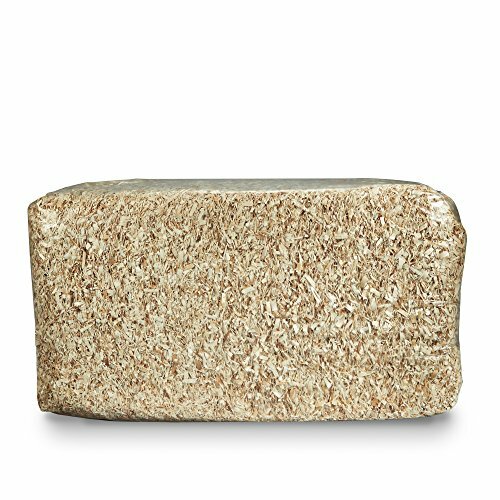 We are using a product called Dry Den. They are small pellets that turn into sawdust when they get wet. This bedding is good for both ducks and chicks. You will need to replace the bedding every couple of days. If it isn’t too bad I use a clean cat litter scoop to get the worst of it out and add a fresh layer of bedding. If you decide to use shavings for duck bedding, make sure to get pine shavings, and not cedar shavings. Cedar shavings give off fumes that are harmful to baby ducks and chickens. 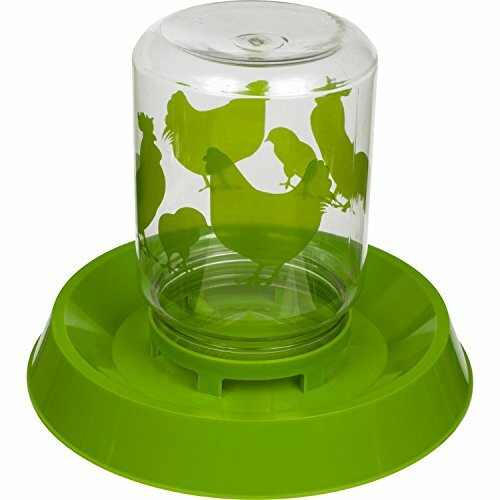 Next place the feeder and waterer in the container. I used self-feeders like this one so that I wouldn’t have to keep refilling it. You can use the same types of self-waterers for food and water. Do ducklings need a heat lamp? If baby ducks aren’t being kept warm by their mother, they need extra heat for the first couple weeks of life. 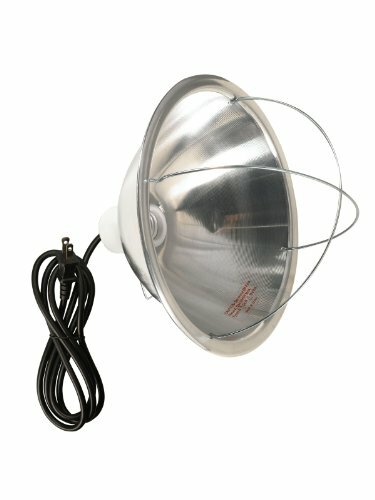 You need to hang a heat lamp above the storage container or bed. You can place a thermometer in there if you like to regulate the temperature, but it is pretty easy to see if the temperature is right. If the ducklings get too hot they will get as far away from the lamp as they can and even start panting. If they are cold they will huddle together to stay warm. The heat lamp will come with a clamp to attach it to the container, but you may find that you need to attach it or hang it from something else to get it the right height. The only way to regulate the heat from the heat lamp is to raise and lower the lamp until you get the temperature just right. In a couple of weeks, depending on the time of year, the ducks will not need extra heat. Just watch them closely to see if they need extra heat or not. It is best to let your ducklings eat and drink at will until you put them outside. They need access to food and water at all times, especially water. If they eat they have to have water to wash the food down or they won’t be able to swallow it. Ducks also need water to wash their nostrils, so keep an eye on their water dish. They drink and spill a lot of water, so they will go through it very quickly. Your ducklings will need to be in the house for at least 6 weeks, until they are fully feathered. When they have all their feathers you can put them in a pen outside. They will need shelter from weather and predators, as well as a pen to keep them safe at night. In the mean time, it is fine to take them out during the day if the weather permits. Place a couple of inches of water in a kiddie pool and let them swim. Make sure to supervise the ducklings outside at all times to make sure they don’t drown or that they don’t fall prey to predators. Most of all, have fun with your new pets. They are so fun to watch, and will bring enjoyment to the entire family.